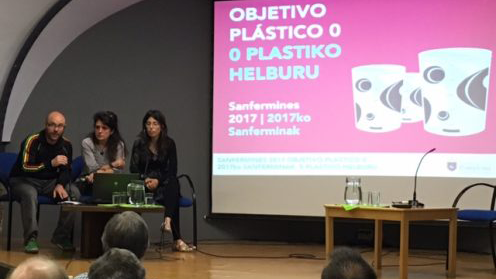 This afternoon, the Area of Urban Ecology and Sustainable Mobility from Pamplona City Hall, has invited representatives from the catering and bar sector as well as other interested citizens to a meeting – discussion session in order to present an outlined plan to promote the use of recycled drinking glasses during the Sanfermin fiestas of 2017 in the hope of achieving more sustainable fiestas this coming July. While some details remain to be agreed upon, the target of, “0 Plastic” is the aim behind these steps to try to replace the throwaway plastic glasses which have been in use over these past several years. It is hoped to reduce the garbage content of the plastic glasses by some 75% (56.000 kilograms less). Some earlier experiments carried out at other large -crowd events such as Nafarroa Oinez, Gora Iruñea, Bayonne, Terrassa as well as some other smaller trials made by the City Hall of Pamplona during Sanfermin Txikito in September, have led the authorities to believe that there exists a good base on which to try to implement the changes for the coming Sanfermin fiestas in 2017.